There has been a significant increase in the appearance of conspiracy theories in Russia over the past seven years. A new study shows that references in Russian media to a select group of popular conspiracy theories are on average six to nine times more frequent now than they were in 2011. Disinformation is among the factors experts name as the reason for this increase. The study was carried out by the independent Russian daily Vedomosti together with the Russian media monitoring company Medialogia, and looked at data from 43,000 different Russian media outlets, including TV, radio, online and print media, in the period from 2011 until 2017. The survey gave the different conspiracy theories a rating on the basis of a methodology whereby more points were given to cases when the conspiracy theories were picked up by media with big audiences, such as the national TV channels, and less points were given to cases where they appeared in smaller media with more limited outreach. At the same time, the study counted the total number of mentions of each of the conspiracy theories. The article in Vedomosti presents a top 10 list of the conspiracy theories in Russian media with the highest rating. As examples from our reporting show, even theories whose origin is not tied to Russia or the Kremlin’s policies can be integrated in the flow of politically motivated disinformation. The notion that Russia is the target of a coordinated attack from a network of historians, who allegedly falsify and distort the country’s history, is by far the most popular among the conspiracy theories in Russian media. With a total of 15,730 mentions in the study’s data, this conspiracy theory’s rating is 3.7 times more popular than the second most popular theory. Its frequency rose 9.3 times from the first quarter of 2011 (619 mentions) and the fourth quarter of 2017 (5,808 mentions). Vedomosti sees the success of this conspiracy theory as a result of numerous leading Russian politicians and opinion formers giving voice to this conspiracy it, including the President and the Culture Minister, who supported these claims in a book he published in 2012. The study also shows that a peak in the theory’s popularity coincided with the attacks on the film Mathilda about Russia’s last Tsar, and other heated debates around the 100thanniversary of the 1917 Revolution and the killing of Russia’s last imperial family. The Russian Orthodox Church has promoted the theory that the killing of Russia’s last imperial family in 1918 was in fact a “ritual murder”, carried out by a Jewish conspiracy. The claim that mankind is in fact controlled by a world government is also known as the New World Order conspiracy theory. It is a part of a cluster of similar theories, including the one targeting George Soros and the conspiracy theory about the Rothschild family, whose mentioning in a prime time Russian state TV news broadcast we have described in an earlier article. The secret world government theory was mentioned a total of 4,249 times in the study’s material, and six times more often in Q4 2017 (1,365 mentions) than in Q1 2011 (224 mentions). 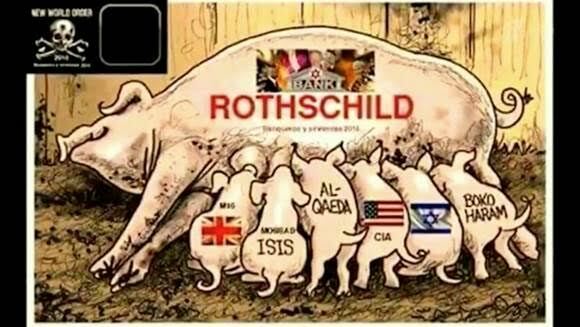 This image was shown in a Russian state TV prime time news programme to promote the Rothschild family conspiracy and its alleged support of Emmanuel Macron. Image: Pervy Kanal. The spread of the HIV/AIDS conspiracy theory should be seen against the sad background of HIV being a serious problem in Russia. The theory holds the second place in relative growth among the cases analysed in the study, having become 36 times more frequent when comparing Q1 2011 (75 mentions) to Q4 2017 (2,700 mentions). HIV/AIDS was a central part of a disinformation campaign during the Cold War when the Soviet Union try to spread a rumour that HIV/AIDS was the result of US experiments. 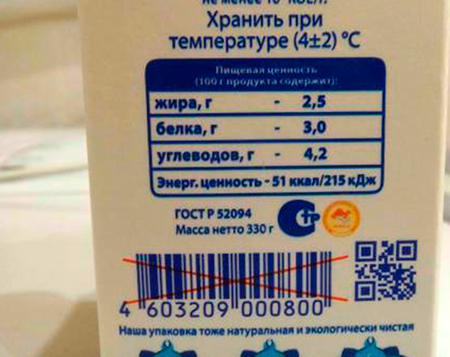 We have seen this conspiracy used in pro-Kremlin, politically motivated disinformation when it was claimed on Russian state TV that the US is buying Ukrainian land to sow genetically modified crops, and that this will cause famine in Ukraine. The GMO conspiracy theory was mentioned 9.7 times more often in Q4 2017 (1,351 mentions) than in Q1 2011 (139 mentions). RT (Russia Today) has claimed that in the West, microchips are implanted under the skin of office workers to make them more submissive and passive. The mildly speaking controversial claim the world is governed by reptilians or visitors from outer space popped up 18,102 times in the surveyed data, with 8.6 times increase from Q1 2011 (263 mentions) to Q4 2017 (2,270 mentions). As we described in an earlier article about conspiracy theories in Russia, a candidate in Moscow’s 2013 mayoral election gained some publicity when she argued that reptiles from a fictional planet reside a mountain region in southern Russia, where they have wiped out an ancient Slavic civilization. This conspiracy theory is by no means homegrown in Russia; nevertheless, reference to it was detected 6,608 times in the study’s data with a drastic 11.2 times increase between Q1 2011 (85 mentions) and Q4 2017 (956 mentions). Fully in line with the overall systematic targeting of the US in the Kremlin’s international propaganda outlets, Sputnik has peddled the idea that the Americans perhaps never made it to the moon. 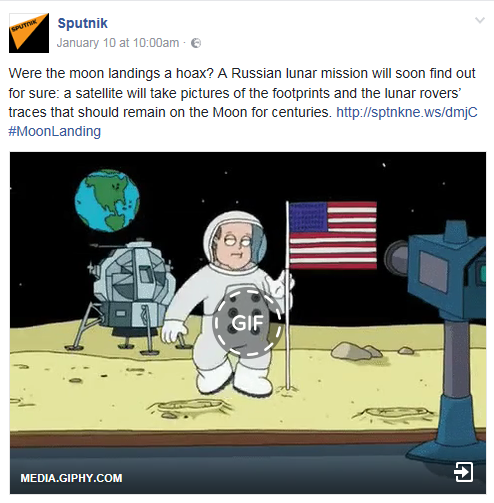 The state propaganda outlet Sputnik has promoted the moon landing conspiracy theory. Image: Sputnik. While scepticism towards vaccination is a well-known global phenomenon, it becomes a conspiracy theory when it is claimed that the alleged knowledge about negative effects is being kept in secret from the public eye, or when it is e.g. said that a vaccination program is in fact a hidden biological attack. Vaccination conspiracy theories appeared in Russian media 6.2 times more often in the fourth quarter of 2017 than in the first quarter of 2011. Pushing narratives about the concealment of secret underlying agendas and agreements is a central element of pro-Kremlin propaganda and thereby a case of where we see a strong degree of overlap between conspiracy theory and the pro-Kremlin disinformation campaign. 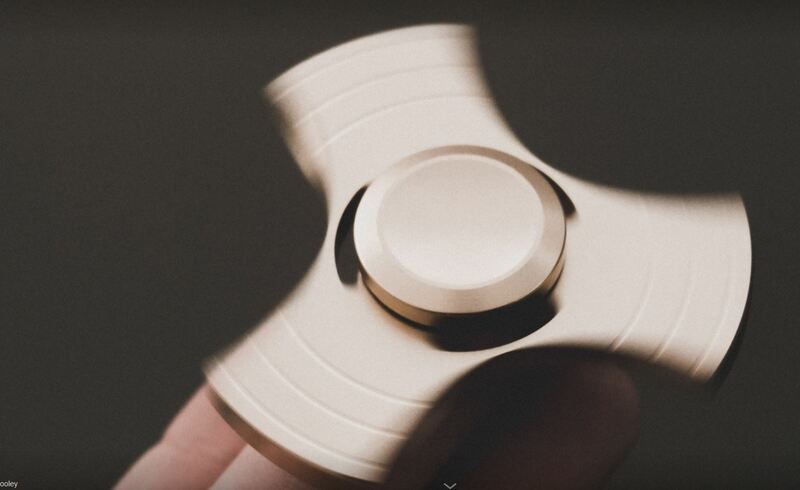 Russian state TV has claimed that the popular fidget spinner is a part of a conspiracy to topple the Kremlin leaders. With a law banning “propaganda of non-traditional sexual relationships”, Russia is not known as a friendly environment for the LGBTI community. The conspiracy theory purporting the existence of a lobby of gays who – not unlike the network of historians mentioned above – allegedly wish to destabilise Russian society, takes the alienation of gay people to a new level. The claim appeared 12.9 times more often in Q4 2017 than in Q1 2011. Claims about the gay lobby have been voiced in the official Kremlin propaganda outlet, Sputnik, and on the nationwide television channel REN TV. “Europe is the kingdom of gays“ is the title of a broadcast with REN TV host Igor Prokopenko, who is also the author of another TV programme in which it is claimed that the world is flat. Mr Prokopenko won the 2017 Russian national TV awards in the category “best educational programme”. Image: Youtube. The idea that the world is flat and not round is not too crazy to become integrated into the flow of pro-Kremlin disinformation. For example, the winner of the 2017 Russian national television award for “best educational programme” is also the author of a TV programme in which it is claimed that the world is flat. This conspiracy theory is the fastest growing among the top 10 conspiracy theories in the study with 44.6 times increase between the first quarter of 2011 and the fourth quarter of 2017. The conspiracy theory about freemasons is also old and international; however, it has had a revival in Russia with 5.9 times rise between Q1 2011 and Q4 2017. REN TV, a Russian TV channel known for its dense mix of disinformation and conspiracy theories, is among the Russian media outlets that have given voice to this claim. As we see in the examples above, conspiracy theories can easily become integrated into disinformation; especially in a media environment where there is a high degree of multi-level state control. The incorrect claims brought forward in the conspiracy theories become instrumental in a politically motivated campaign which focuses on confusing and distracting audiences. But conspiracy theories are not just useful as material for disinformation campaigns. Audiences that are often confronted with disinformation can perceive conspiracy theories as less problematic than other audiences. Commenting to Vedomosti on the study’s findings, Dmitry Leontiev, a psychologist at Russia’s National Research University Higher School of Economics, sees the dramatic increase in the popularity of conspiracy theories as a result of a societal order in which “the distinction between real and unreal ceases to be relevant”. In Leontiev’s words, “conspiracy theories are supported by the information policy in [Russian] media where the truth only plays a secondary role, and where messaging, even from sources with authority, mixes correct information with claims that are in no way verified”.